One area that continually causes confusion is that of Photoshop masks. This tutorial provides a brief introduction to help you understand Photoshop masks and how they can be used in the photo editing process. This is one of a number of tutorials on Lenscraft which can help you learn how to use masks. If you prefer watching videos to reading, you should see my video tutorial Introduction to Layer Masks in Photoshop. The best way to understand masks is by a simple example. I want you to imagine that you are painting a blue wall with red paint. Before you start to paint you cut out a heart shape from a piece of paper and stick it on the wall. You then paint the entire wall red and in the process paint over the paper heart. When you then remove the paper heart you will reveal the blue paint beneath the red. You will have masked out a section of the wall in the shape of a heart. Photoshop masks are almost identical to the above example, but you should imagine the paint is a layer over the image. When we use layers in our image editing, changes we make are placed on separate layers rather than applied directly to the image. This then allows us to make changes to the individual layers to affect how the image appears. For example, we could reduce the Opacity of the layer to adjust how strong the effect of the layer is. We can even hide the layer entirely to remove the effect from the image. This is known as non-destructive editing as we can continue to adjust or even remove image edits. We use masks with layers to target adjustments onto specific areas of the image. The following sequence of images illustrates this. This is the starting image with no adjustments applies. Here we see a black and white adjustment layer has been applied on top of the original image to make it appear black and white. Here is the Photoshop mask that attaches to the black and white adjustment layer. This is the resulting image. Notice the Photoshop masks prevent the adjustment layer from turning that part of the image to black and white. Instead it reveals the colour of the original image. At first this can be difficult to remember but there is a simple rhyme you can use “black conceals and white reveals”. 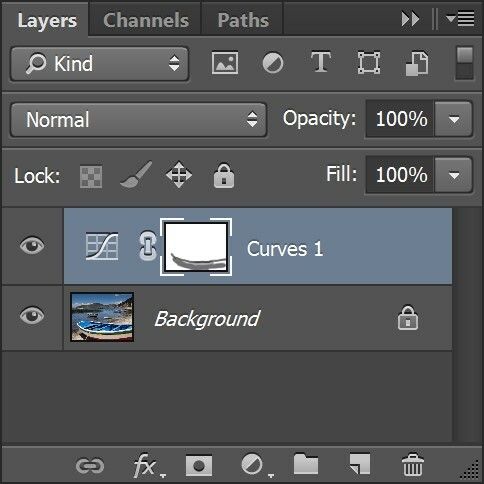 Areas of an adjustment layer where the Photoshop mask's black will conceal the adjustment from the finished image. Areas where the mask is white will reveal the adjustment in the final image. 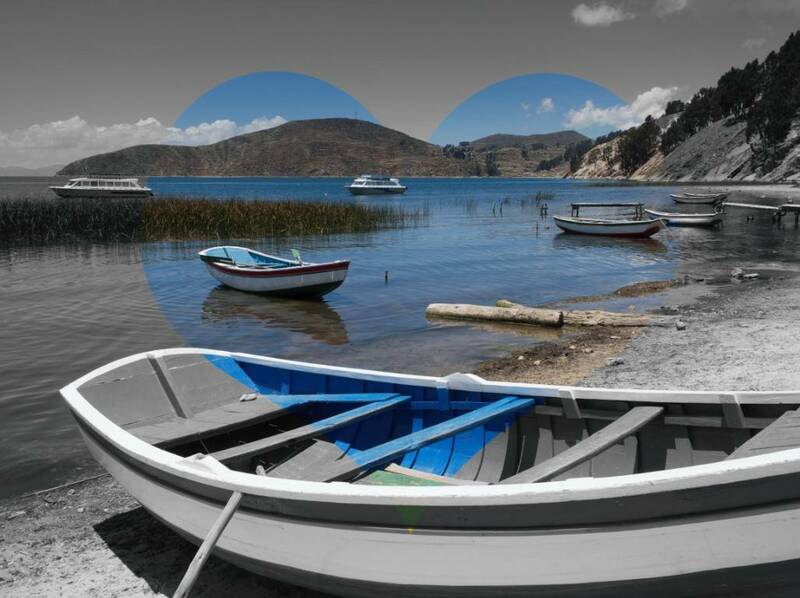 When you add an adjustment layer to an image, a white mask automatically appends to it. As the white mask is across the entire area of the image, any adjustment you make with the layer will appear across the entire image. This is a global adjustment. To make localised adjustments you would need to paint on the white mask with black to hide the effect. 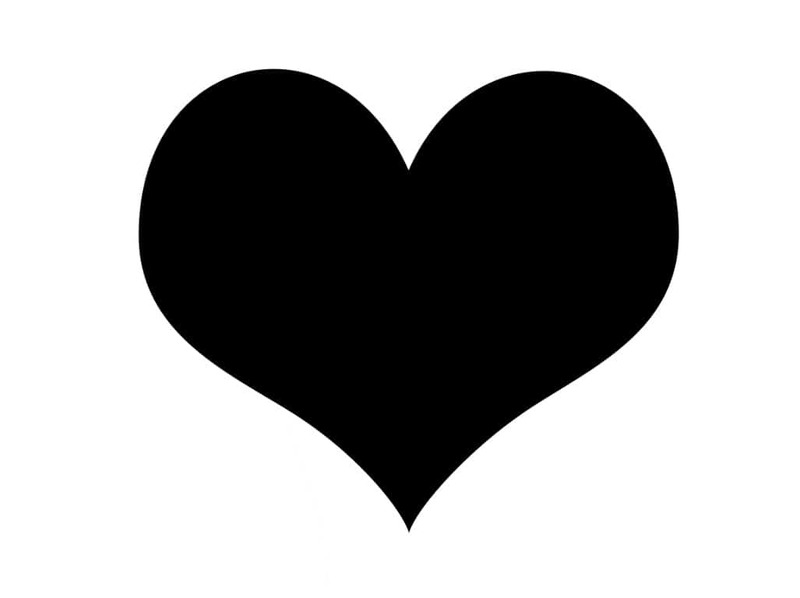 We added the heart shape mask in the previous example using Photoshop tools. If you want to create masks you need to paint or draw them. The easiest way to do this is by using the paintbrush tool. Take the example of applying a strong contrast adjustment to our image but we don’t want the adjustment to apply to the white areas of the foreground boat. We can hide the adjustment from these areas by painting on the adjustment layers mask with a black brush. You can see this in the following screenshot. Look at the thumbnail of the Curves layer mask in the layers window and you will see where the effect has been “painted out” from the mask. You can see a close up of the layers window below. To help blend the adjustment layer with the background image be sure to set the opacity of your paintbrush to less than 30%. You will then need to build up the adjustment with multiple brush strokes but it’s less noticeable. You should also ensure the paintbrush is set to have a soft edge. If you find the edge of the effect is visible, try applying a blur to the layer mask. Learning to create masks is a skill you should practice. There are several techniques you can use to make intricate and selections (masks) much easier but these are beyond the scope of this tutorial. 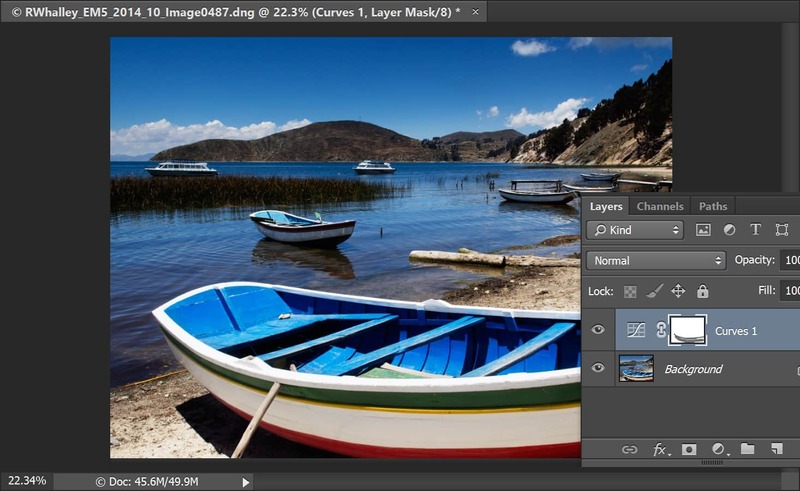 One of the common misunderstandings from inexperienced Photoshop users is that there must be a tool or filter that can automatically create what they want to do. Whilst the Photoshop masking tools are improving, this isn’t yet possible. For a more advanced example using Photoshop masks, this tutorial looks at how to blend two images together.